The correct diet of Sugar Gliders is controversial subject. 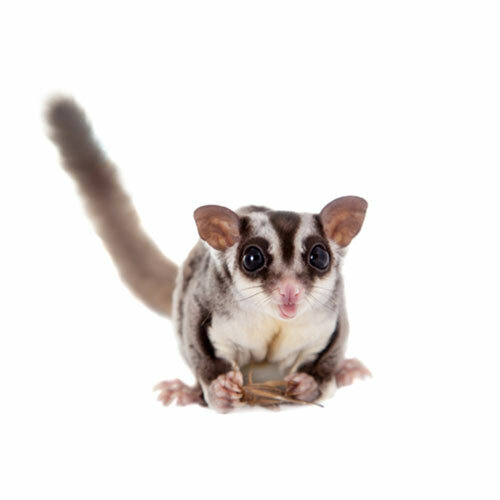 Like many animals that are relatively new in the pet trade, a Sugar Glider's nutritional needs are somewhat of a mystery, but the longer they are kept in captivity the more is known about their needs. Unfortunately many books, pet stores and Internet sites give out conflicting information, which does little to help the situation. However, as with most species, discovering what works nutritionally is a matter of trial and error, as there are few studies done on the nutrition of pet species other than cats or dogs. Obviously, the requirements of Sugar Gliders are of importance to their overall health, and they are prone to metabolic bone disease resulting from an improper ratio of calcium to phosphorus in the diet. If a diet is relatively higher in phosphorus than calcium, calcium will be leached from the bones and other tissues to balance the levels in the blood. This results in a softening of the bones, making them susceptible to fractures, along with a myriad of other health problems related to calcium imbalance. Sugar gliders (in the wild) feed on eucalyptus gum, sap, insects, nectar, and honeydew (an excretory product of nectar eating insects). They will also eat bird eggs, lizards, small birds and other small prey items. This diet is pretty difficult to replicate in captivity. So a variety have food have been fed, in an attempt to somewhat mimic their natural intake and to see what makes them thrive in captivity. There are many 'Diet Plans' that have been, and still are used with success. The main drawback to these plans, are that they are time consuming to blend, require many ingredients, have to be stored refrigerated, and go bad if not used with-in a few days. Although these diets are nutritious, many glider owners find it tedious to continuously have to find, purchase and blend all the ingredients together on a regular basis. Owners typically take on the task for a few weeks, then look for alternative, easier methods of feeding. The other drawback to concocting your own diet plan is that you are never sure that your glider is getting the correct nutrition. Protein, vitamin & mineral content can vary from batch to batch. Fortunately, there is now a simpler way to offer a nutritious diet to your gliders. Now available is a product called Instant-HPW (See our Sugar Glider Food department). This new food combines all of the advantages of a 'home-made' diet into an easily prepared powder. But what is the ideal diet? We recommend that adult Sugar Gliders be fed a varied diet. Exotic Nutrition's 'Premium Sugar Glider Diet' should be available at all times. It stays fresh for months and can even be refrigerated for longer storage. To enhance the flavor of the Premium Sugar Glider Diet ... along with the nutritional content of the diet, simply add our new INSTANT-HPW to the pellets. INSTANT-HPW has a tempting vanilla flavor that Sugar Gliders LOVE. Gliderade nectar supplement should be offered on a regular basis. It is very high in carbohydrates and contains vitamins and bee pollen (something that gliders feed on in the wild). Gliderade comes in a powder form; you must mix the powder 5 to 1 with water, although we prefer to mix it 4 to 1 to thicken the liquid, then offer approx. 1 tablespoon per day in a separate dish. Acacia gum is part of the Sugar Glider's natural diet. Acacia gum is available in powdered form (see our Supplements & Nectars department). Just mix a teaspoon of powdered Acacia gum with water, and offer the resulting paste to your gliders. You can also offer Exotic Nutrition's Berries & Bugs diet a few times a week for variety. Fresh water should be available at all times, a calcium supplement Glider-Cal and multivitamin Glider-Booster can be sprinkled over fresh fruit three times a week, this ensures that you adult Sugar Glider is maintaining the calcium and vitamin levels required, although supplements are not necessary if your glider consumes enough of the Exotic Nutrition's Premium Sugar Glider Diet. It is important that you keep the ratio of 40% fruits and vegetables to 60% protein based foods. If you offer to much fruits your glider will fill up on the fruit, and not eat the necessary protein based foods. Use vitamin supplements when necessary, but don't overdo it. Too many vitamins can be just as harmful as not enough. Start out by feeding about 3-4 tablespoons of food per night, per glider. If they eat it all the first night add a little more the next night until they leave only a little bit.